Take a breath of fresh air. Can you feel it? Baseball season is fast approaching, right as spring weather (finally, supposedly) rolls into our city. This morning we chat with Phillies reporter Scott Lauber ahead of opening day later this week to get a look at the journey ahead. But perhaps the most highly anticipated event of the coming days will be a public summary of special counsel Robert Mueller’s investigation report, which could drop at any moment. Keep an eye on Philly.com for updates. Now that special counsel Robert Mueller has delivered his report on his investigation into Russian interference in the 2016 U.S. presidential election, Attorney General William Barr is expected to release his first summary of Mueller’s report as early as today. March for Our Lives Philadelphia is holding a rally against gun violence at LOVE Park today from noon to 3 p.m. It marks a year since a national day of marches followed the tragic school shooting in Parkland, Fla. The Phillies’ opening day is this Thursday, and they hit the ground running by starting the season against the Atlanta Braves. It’s the first of 21 early-season games against NL East opponents. Temple University will hold free clinics this week to provide vaccines to students, faculty, and staff after an outbreak of mumps has spread to 86 students over the last month. The NCAA Tournament will continue this week, but you won’t have a local team to root for after Villanova lost 87-61 to Purdue last night. 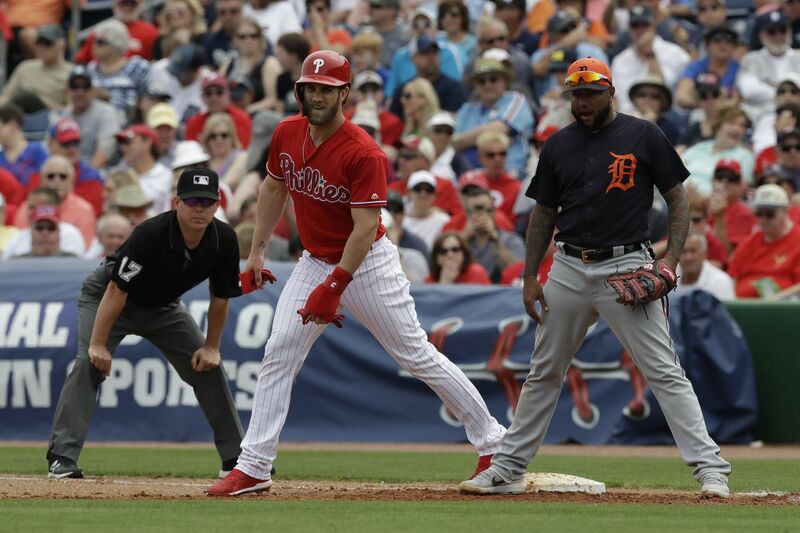 Philadelphia Phillies' Bryce Harper, center, and Detroit Tigers first baseman Ronny Rodriguez after Harper's single off during the fourth inning of a spring training baseball game Wednesday, March 20, 2019, in Clearwater, Fla.
Each week we go behind the scenes with one of our reporters or editors to discuss their work and the challenges they face along the way. This week we chat with Inquirer sports reporter Scott Lauber, whose eyes and ears are on the Phillies. The team is only a few days away from their first regular season game and you can expect Lauber to be on top of the latest news with colleagues Matt Breen and Bob Brookover. For more on the Phillies from our writers on the beat, sign up for the Extra Innings newsletter. You’ve been back in Philly for almost a year now. Before this you reported on the Boston Red Sox for ESPN for several years. How would you describe your experience in Philadelphia vs. Boston? What are some major differences and similarities between the teams and their fans? I've been privileged to cover baseball in Boston and Philadelphia for 14 years, and I can probably best sum it up by paraphrasing something that Red Sox owner John Henry told me shortly after I got to town in 2010: "Even when it seems quiet, there's always something to write about." That isn't true of every baseball city, and trust me when I tell you that it's because of the fans. Their passion for sports, especially baseball, is unquenchable. For the players, that translates into high expectations. For a reporter, it means a great demand for information. At their core, fans in Boston and Philly are similar in so many regards. The biggest difference is that Boston fans have grown spoiled from so much winning over the past 20 years, while Philly fans are still relatively starved for championships, the Eagles’ Super Bowl notwithstanding. Bryce Harper is the talk of the town, and you recently described Phillies’ owner John Middleton having a “Steinbrenner moment” to land the star. For the casual baseball fan, tell us the significance of that moment. What does it mean? When the late George Steinbrenner owned the Yankees, he was notorious for getting his man. Whether it was Catfish Hunter or Reggie Jackson, Dave Winfield or Goose Gossage, Steve Sax or Wade Boggs, Steinbrenner was relentless. A few years ago, before most Phillies fans knew much about John Middleton, Jimmy Rollins compared him to Steinbrenner for his competitiveness. And we saw that play out in the pursuit of Harper. Three days after Manny Machado signed with the Padres, Middleton flew to Las Vegas to meet with Harper. He went with his wife, not with any baseball operations personnel. They had dinner with the Harpers on a Friday night, then stayed over and had lunch with them the following day. During those meetings, he sold Harper on why he had to come play in Philly, and from talking to Harper this spring, it's clear that it left an impression. It helped, of course, that Middleton made Harper a $330 million offer he couldn’t refuse. But flying out there was very Steinbrennerian. Middleton wasn’t going to be denied. Aside from Bryce Harper, what are some other storylines you think Philly fans should pay attention to? a) Do the Phillies have enough starting pitching to win the division? Anyone who watched Vince Velasquez in spring training can agree that it's a legitimate question. A bounceback from Jake Arrieta might be the key to the whole season. b) Gabe Kapler is always worth watching. After this season, he has one year left on his contract. If the Phillies struggle or otherwise underachieve, his seat is bound to get hot. c) J.T. Realmuto. He’s probably the best catcher in baseball, and if not for Harper, we’d be talking more about the impact that trading for him will have on the Phillies. As a baseball writer you’re covering a sport that stretches almost an entire year. How do you keep ideas flowing on days where it feels as if the season has fallen into a comfortable routine? It’s easier in Boston and Philly, that’s for sure. But you’re right: It is a long season, and the baseball schedule, more than maybe any other sport, is predicated on a certain rhythm and pace. It can be challenging to come up with fresh ideas during the proverbial dog days of the season. But that’s where it’s important to be around the team as much as possible. The more people you talk to, the more conversations you have, the easier it is to generate those ideas. What does your gut tell you when it comes to predicting how the Phillies will fare this year? Expectations have skyrocketed since Harper joined. Do you expect to see a deep run into October? One thing I've learned over the years is that October can be a crapshoot. I've covered two teams that won the World Series (2008 Phillies and 2013 Red Sox), one that got there and lost (2009 Phillies) and three others that made the playoffs (2007 Phillies and 2016-17 Red Sox), and I can't honestly say that I knew how any of them would fare once they got to the postseason. But I do think the Phillies will make the playoffs, if not as a division champion then as a wild card. They’re built around offense, and just like the 2007-08 teams, I think the offense is good enough to carry them. Once they get to October, anything can happen. What’s one thing you’re really excited to follow once the regular season kicks off? It’ll be interesting to me to see how quickly the Phillies can come together as a team. Harper isn’t the only new face. There’s a new catcher (Realmuto), shortstop (Jean Segura) and left fielder (Andrew McCutchen). There are new relievers (David Robertson, Jose Alvarez, Juan Nicasio). With so much roster turnover, it can take a team a while to gel. But with 21 of the first 28 games against NL East teams, the Phillies can’t afford a slow start. Follow Scott Lauber on Twitter at @ScottLauber or get in touch via email at SLauber@philly.com. Inception meets Philadelphia. Nice twist, @pennwyst. Our readers’ latest question: Why aren’t Philadelphia’s murals vandalized more often? The answer: You can thank the relationship between the mural and graffiti communities. Eating: Pizza from Pizzeria Beddia, the best pizza in the country, according to Bon Appétit. They recently opened up a second spot in Fishtown. Drinking: Whatever we want, knowing we can pick up a hangover sandwich from Roots Cafe in West Chester. Watching: Us, the latest thriller from Jordan Peele, which may make you squirm in your seat and cover your eyes. Be warned: there’s a lot of blood in the film. Cooking: A savory loaf of toasty honey cornbread, courtesy of food blogger Amanda Frederickson’s latest tome, The Staub Cookbook. I know so many people are against the SafeHouse but from what I understand it’s not only a safe place to get drugs that people are severely addicted to and dying on the streets because they are buying drugs laced with fentanyl, it’s also a place where they can talk to someone about coming off of the drug and getting help with detoxing from the drugs. I’m certainly not for using drugs but I am for saving lives and right now these people need a Safehouse where people care enough to have them use their drug without dying from it. People say just stop but those who say this have no idea what the addict is going through and have obviously not lost a loved one from addiction. — Hburke01, on Agency planning first supervised drug injection site in U.S. is offered lease in Kensington. Columnist Maria Panaritis got the chance to sit in on a monthly reunion lunch with some of her former teachers from Beverly Hills Middle School. Plenty of memories, and some secrets, were shared.